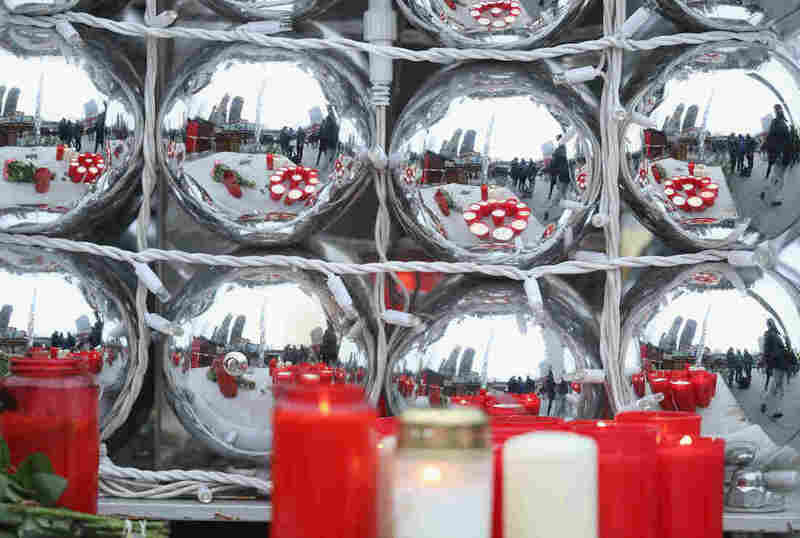 Man Arrested Following Berlin Truck Attack Is Released : The Two-Way A truck crashed into a Christmas market on Monday, killing 12 people in what police call an intentional attack. A suspect was detained, but German officials say he is no longer in custody. 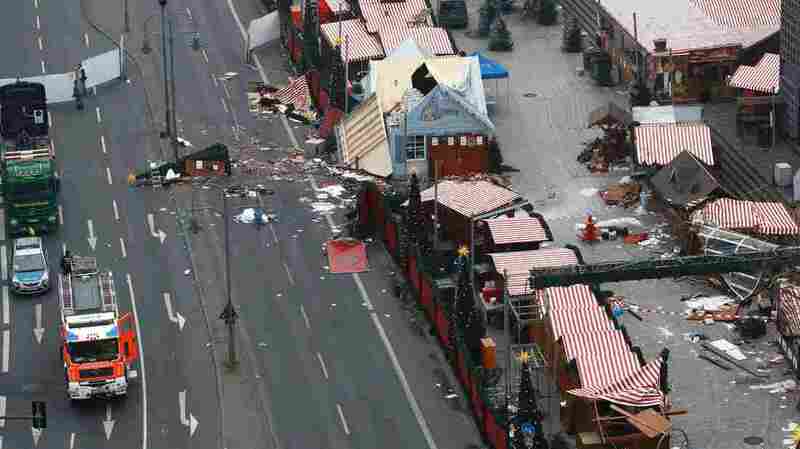 A day after a truck attack on a Christmas market in Berlin killed 12 people and wounded 48 more, the only identified suspect has been released from custody due to a lack of evidence, according to German officials. No other arrests have been made in connection with the attack. ISIS' semi-official Amaq news agency claimed that the driver was "a soldier of the Islamic State" who was responding to the group's calls to carry out attacks, according to the SITE Intelligence Group, which monitors militant websites. The briefly detained man — a 23-year-old Pakistani asylum-seeker — denied any involvement with the attack, and police had said at a press conference earlier Tuesday that they were not entirely certain he was the person driving the truck during the crash. Now, German officials say the man has been released from custody after an investigation didn't turn up evidence connecting him to the attack. The investigation "did not yield any urgent suspicion" against the man, the chief prosecutor's office said in a statement, according to Reuters. Prosecutors noted that eyewitnesses tracking the assailant as they fled the scene lost sight of the man. "The man arrested matched witness descriptions of the truck driver, but investigators haven't been able to prove that he was in the truck's cab at the time of the attack," The Associated Press writes. "Under German law, prosecutors have until the end of the calendar day following an arrest to seek a formal arrest warrant keeping a suspect in custody." On Twitter, while the man was still in custody, the Berlin police had already asked Berlin residents to "be alert," apparently alluding to the possibility that the perpetrator might still be at large. There is "no doubt" the crash on Monday was an intentional attack, German Interior Minister Thomas de Maiziere said at a press conference Tuesday. Chancellor Angela Merkel had previously said authorities "must assume" the attack was an act of terrorism. De Maiziere identified the suspect who had been detained as a Pakistani asylum-seeker whose application for asylum had not been fully processed. He was "known to authorities" but not suspected of having any ties to terrorism, the interior minister said. "But Merkel, who has been criticized for allowing in large numbers of migrants, addressed head-on the possibility that an asylum-seeker was responsible.
" 'I know that it would be particularly hard for us all to bear if it were confirmed that a person committed this act who asked for protection and asylum in Germany,' Merkel said. 'This would be particularly sickening for the many, many Germans who work to help refugees every day and for the many people who really need our help and are making an effort to integrate in our country.' "
The chancellor was expected to visit the site of the attack later Tuesday. The owner of a Polish trucking company told a German broadcaster he had identified the man to police as the truck's original driver, and the first apparent victim of the attack, the AP reports. "His face was swollen and bloodied. It was really clear that he was fighting for his life," trucking company owner Ariel Zurawski told TVN, according to an AP translation. As The Two-Way reported yesterday, the U.S. State Department issued a warning last month of a "heightened risk of terrorist attacks throughout Europe, particularly during the holiday season." "They start about four weeks before Christmas. You have to picture little huts, with all sorts of handicrafts, and they sell all kinds of foods and of course the very famous Glühwein, or mulled wine, which is the most popular drink that you would get there. It's just a fun place for family and friends to get together." De Maiziere said the market in Berlin will be closed on Tuesday out of respect for the victims and their families, but that other Christmas markets in Germany will continue to operate as planned. The interior senator for the state of Berlin also said Tuesday that New Year's celebrations in the city will continue as scheduled.